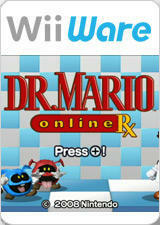 Dr. Mario Online Rx, released as Dr. Mario & Saikin Bokumetsu (Dr. MARIO & 細菌撲滅 Dokutā Mario ando Saikin Bokumetsu, lit. "Dr. Mario & Bacteria Extermination") in Japan and as Dr. Mario & Germ Buster in Europe and Australia, is a puzzle video game starring Dr. Mario. As with other Dr. Mario games, players must manipulate pills to destroy colored viruses in the game area. This game also features a version of the Nintendo DS title Brain Age 2's "Virus Buster/Germ Buster" mini-game, which uses the pointer function of the Wii Remote to move pills, and now allows up to four players to participate cooperatively. The title supports the Nintendo Wi-Fi Connection service, allowing players to compete with one another over the Internet. Players can also use Mii characters or Dr. Mario during gameplay. With Enable EFB Copy: To Texture the Mii faces aren't rendered correctly. Refer issue 2112. The graph below charts the compatibility with Dr. Mario Online RX since Dolphin's 2.0 release, listing revisions only where a compatibility change occurred. 2.0 Windows XP AMD Athlon II x2 215 @ 3.56GHz NVIDIA GeForce GT 440 Work's at 100% of speed. No glitches, but is this OK what 3D Wii-Mii - has no eyes? only glases on empty face. †.fl.l). This page was last edited on 23 May 2018, at 11:26.